Based in Maranello, Italy, Ferrari is one of a few manufacturers of ultraluxury supercars. Sometimes mistaken for Lamborghinis, Ferraris are typically curvier, less angular and designed almost exclusively by Italy's Pininfarina design studio. Recently added models include the V-8-powered mid-engine 458 Italia and the front-engine Ferrari California, a retractable hardtop convertible with four seats. V-12 models include the two-seat Ferrari 599 and the four-seat 612 Scaglietti. 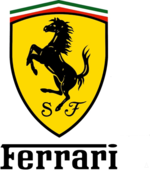 Ferrari is wholly owned by Fiat SpA of Turin, Italy.